Manuel Amândio Gonçalves was born in Porto in October 1861. He graduated at the Faculty of Philosophy of the University of Coimbra and taught at the Industrial and Commercial Institute of Porto. In 1884, he ran for the position of substitute teacher of the Philosophy Department of the Polytechnic Academy of Porto and submitted the thesis "Equilibrio Electrico nos conductores". He was appointed for this position by decree of 19 June and royal writ of 7 August 1884, taking up office on 25 June of that year. In 1885, he rose to the position of professor of the 11th Chair – Zoology by decree of 19 August 1885 and royal writ of 24 December of the same year. With the death of Sales Cardoso, he was transferred, at his own request, to the 10th Chair – Botany, by decree of 6 February 1890. 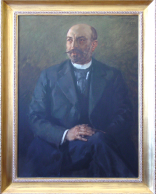 He directed the Botanical Garden between 1890 and 1910 and, after the establishment of the Faculty of Sciences of the University of Porto, became ordinary teacher of the 2nd group – Biology Sciences, of the 3rd Section. Amândio Gonçalves contributed decisively to the development of the teaching of Botany. As teacher, he set up a fully equipped laboratory of Botany at the University of Porto, and appointed Augusto Nobre and Gonçalo Sampaio as practical assistants. He was a great promoter of Plant Histology.